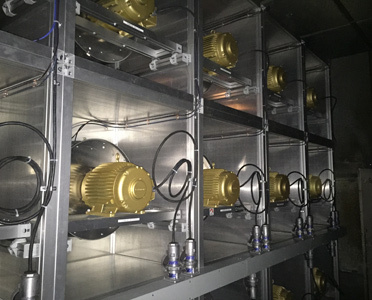 Using a FANWALL system to replace older, end of life fans in existing air handlers can be the most cost-effective solution for avoiding the cost and business disruption of an air handler failure, while delivering energy savings as high as 40%. Retrofits using a FANWALL system have delivered energy savings as high as 40% in applications ranging from offices, education, and hospitals. In many cases, access limitations are a barrier to a fan or air handler replacement because it cannot be accomplished without the time and expense of a major tear-out and reconstruction project. A FANWALL system can minimize this as well as other barriers. An air handler cabinet can retain its integrity well beyond fans, coils and other components, allowing it to be retained with a new FANWALL system. The modular design of FANWALL system allows individual cubes to be navigated through a standard 3-foot door and assembled inside the existing air handler cabinet. There is no need to have a crane on site as is often the case with larger, more conventional fans.The performance of the new system can be upgraded to better match actual capacity and airflow requirements. Ancillary components such as sound attenuators and air blenders that created static pressure penalties in the old system can be removed. Design flaws and other maintenance concerns- such as component access issues and corrosion- can also be addressed, essentially resulting In a new, more efficient air handler in an old skin.Retrofits often can occur over a weekend or during unoccupied time frame to minimize downtime or disruption of normal business.